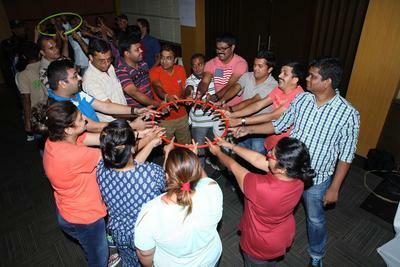 Corporate Team Building programs are more fun and action oriented than classroom oriented theory sessions. In any team building program the facilitator challenges a group to achieve a goal, but does not explain how to successfully complete the challenge. Participants must work to find a solution individually and together as a team, and must communicate and learn from each other in order to be successful. ​The Learning begins with the experience followed by reflection, discussion, analysis and evaluation of the experience. The team building programs help participants discover their inner strengths and relate it to their workplace. The Team Building programs allow participants to learn more about their natural leadership style. The Activities provide your team with the opportunity to discover new and innovative approaches to teamwork. Team building activities also improve workplace projects that involve teamwork. After completing team building activities together, employees better understand each other's strengths, weaknesses, and interests. This understanding helps them work even better together back at work. 1. In-house Team Building Program - Done at your premises. 2. Outdoor Team Building - Done at a resort. 3. Team Experiences - Theme Based team experiences that are both inhouse, outdoor and city bound. We Deliver team building sessions across all Indian metro cities including AHMEDABAD, BANGALORE, CHENNAI, COIMBATORE, DELHI, GOA, HYDERABAD, KOCHI, MUMBAI, PUNE , VIZAG. Mention what you are looking for.